Overall, I think this year was one of the best for Hangout Fest. The festival has managed to grow while still maintaining it’s sense of self. The improvements to the state park have translated into great new spaces for the fest as well. I think the great lawn and the sunset stage are excellent additions to the overall festival vibe. It’s nice to have a place to hangout that’s not concrete or sand – especially as the midday sun hits. We saw some absolutely killer sets from up and coming acts like Noname, Caroline Rose and Greta Van Fleet. 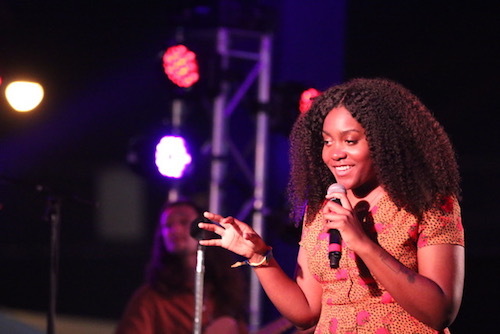 In fact, I think besides St. Vincent, Noname was the highlight of the weekend. The festival is definitely feeling the loss of the AXS Stage. The Beach Stage isn’t quite big enough to take its place and a few performances suffered from lack of space either there or at the Mermaid Stage (Greta Van Fleet caused the Mermaid space to burst at the seams). I’m sure with a few small tweaks the new arrangement will feel perfect. As for Gulf Shores, the town remains an outstanding host for the festivities. In New Orleans we know what it’s like to have our lives upended by a festival and the residents of Gulf Shores really seem to have adopted the fest even for all of its craziness. The restaurants are great and the shopping is top notch. Often the allures of the town can distract from music. Either way you’re going to have a good time. Keep this one in mind for next year. Tonight Danish noise punks Iceage roll into the Santos Bar. The group has just released their fourth studio album Beyondless. This record expands their relentlessly driving approach to composition. You’ll definitely want to be at this show. Check out the video for “Catch It” below. Tonight Iceage is at Santos Bar and David Crosby is at the Joy. Tomorrow, Young Valley hits Siberia and Dave Jordan and the NIA play the Free Friday show at Tips. Saturday you can catch Buckethead at the Joy and The Bayou Country Superfest starts at Champions Square with a free concert featuring Randy Hauser before the main event with George Strait and Kacey Musgraves on Sunday. Also on Sunday, you can see Paris Avenue at Tips or Tyr at Haven. Monday, Galactic is at Tips. Tuesday, The Front Bottoms return to the House of Blues. Wednesday, A Place to Bury Strangers bring their new record to Gasa Gasa and Wolfman holds his usual court at d.b.a.